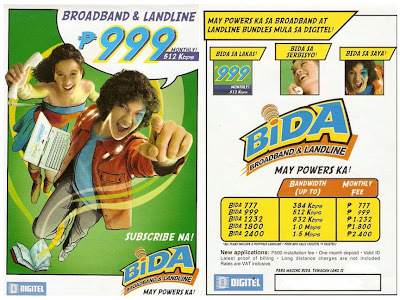 I have signed up to Digitel Bida Broadband Plan 999 just last December 2008. This broadband plan has a bandwidth up to 512kbps for a monthly fee of P999.00 pesos (vat inclusive) . It also includes a postpaid landline with free NDD calls (digitel to digitel) for 1 year. Long distance charges not included. There is no installation fee but I need to pay a 1 month advance payment. It has a locked-in period of 30 months. Before settling down with Broadband and landline plan of Digitel, I first checked other ISPs as to what they could offer. My first option was Globe Broadband Plan 995 with a bandwidth of up to 1mbps, but has no landline. My application was already processed and ready to be installed but I changed my mind when the people who will install it told me that I still need to pay P750/50 meters of wire that will be used in the installation. There was more or less 200 meters needed for the installation, which means I need to pay at least P3000 for the wires alone so I turned down this option. Another option was PLDT's Plan 990 (DSL + Landline) but it only has a bandwidth of up to 384kbps, a modem fee of P1200 and exclusive of VAT. Another option was USATV's Plan 900 cable internet being locally offered here in Pangasinan, with a bandwidth of up to 1mbps but requires also to subscribe to their Cable TV service with a monthly fee of P400. 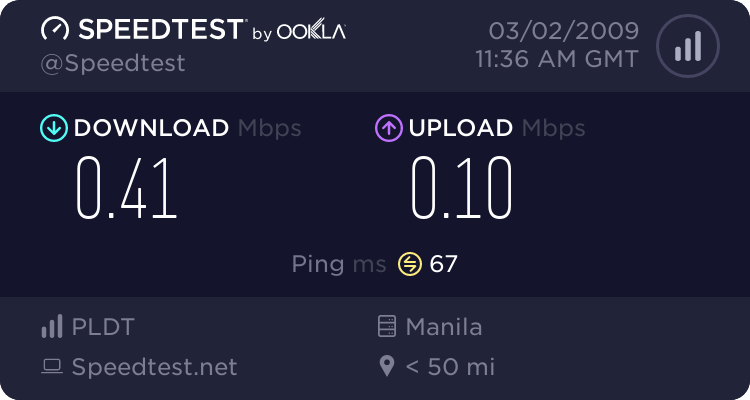 Although, there are many not so good comments that I have read in pinoydsl.net about Digitel's broadband plan, it was the best last option left so I gave it a try and took the risk. The first three weeks was my worst wired internet experience ever. My wireless 3G internet using a Sony Ericsson k810i as a modem was much better than this new wired internet service. I could not easily connect to the internet. The modem needs to be turned off then turned on again to be able to connect for 5 minutes. Then after 5 minutes, it will be disconnected again. My time was really consumed with that. The modem also over heat easily. There was also a time when there was no connection at all for about 3 days straight. I remembered the not so good comments that I have read about digitel's internet service, and because of these glitches encountered with this internet service for the first weeks, I concluded that all those comments were indeed true. I called up Digitel's Broadband Hotline many many many times (sigh..) to report the problem but it took them more than 2 weeks before they have fixed the problem. I also brought the modem (Prolink Hurricane 9200AR) to the digitel's office because I believed that it was the problem and I hoped that they will replace it but they said that it was working just fine. So the modem was retumed to me after they have reset it but it still didn't work when I got home. So I called the hotline again requesting for technicians to go to our place. So after a long time of waiting, finally, the technicians came to our house and checked our connection. I'm very happy that they have replaced the modem with ZTE ZXDSL 831 Series. Now, my internet connection is working just fine. Here's the result: Grade F+ = FAIL!